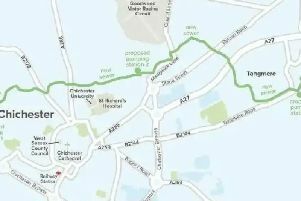 A claim that a senior councillor ‘misled’ colleagues during a debate about the A27 Chichester bypass improvement scheme has been dismissed. Bob Lanzer, who was then cabinet member for highways and infrastructure, addressed a meeting of the environment, communities and fire select committee in June. The committee had been asked for its recommendations for the scheme before the council sent a submission to the government, asking for inclusion in the roads investment strategy for 2020-2025. Following the meeting, a member of the public, who was described as a ‘former specialist in transport scheme appraisal’, wrote to Mr Lanzer. The writer pointed out that some of the terminology used while giving information to the select committee had not been the same as that used by Systra, the consultants appointed by the council to provide technical advice about the scheme. As such, the writer felt the committee had been ‘misled’. In July, Mr Lanzer wrote to Andrew Barrett-Miles, chairman of the committee, clarifying his statements and offering members the chance to share any concerns. The committee met again on September 21 and Mr Lanzer’s letter was shared with members. Mr Barrett-Miles told the meeting he had discussed the matter with Tony Kershaw, the council’s director of law and assurance, whose view was that Mr Lanzer had not misled the committee and there was no need to take things further. Mr Barrett-Miles added: “Tony Kershaw wrote to the member of the public along those lines, that what the cabinet member had said was just his interpretation. A spokesman for the council confirmed that no complaint had been lodged. “Firstly, the Systra report points out that despite the mitigation measures included in the Mitigated Northern Route, there will still be some residual impacts. The presence of residual impacts was not mentioned during the officers’ introductory statement on the Mitigated Northern Route. I note that the officers’ report stated in paragraph 4.8 that; ‘The environmental impacts of this option will be significant, even with carefully configured environmental mitigation measures and there may be some challenging business impacts particularly during construction’.